In this post we will see Nuclear Physics and Nuclear Reactors by A. Klimov. The book covers different aspects of nuclear physics. In chapters 1 to 4 basics of nuclear physics and interactions of elementary particles are considered. Topics covered are atomic structure, elementary particles (Chapter 1), properties of nucleus and nuclear particles (Chapter 2), nuclear transformations (Chapter 3) and interactions (Chapter 4). 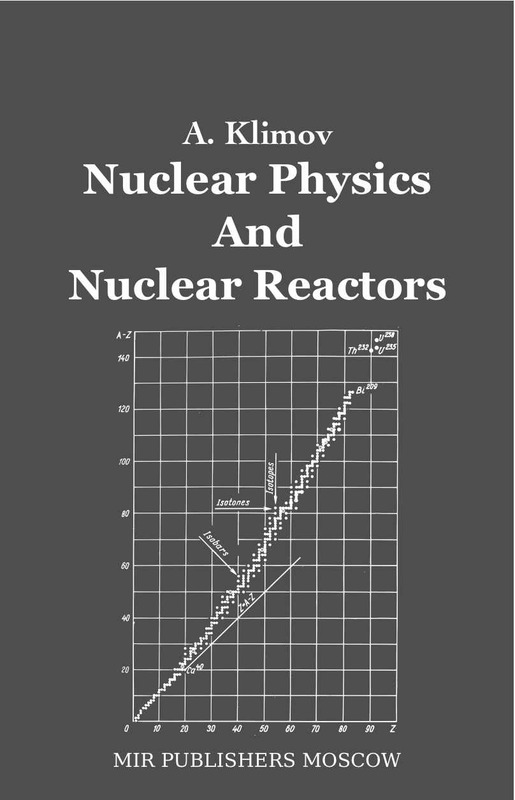 Chapter 5 talks about moderation of neutrons and thus sets stage for the chapters on nuclear reactors (Chapters 6, 7 & 9). The book also talk about shielding against radiation and dosimetry (Chapter 8). The reactors covered are water cooled graphite moderated, Graphite Gas-Cooled Reactors, Heavy-Water Reactors, Light-Water Reactors, Fast Reactors. The book was translated from the Russian by O. Rudnitskaya, and was first published by Mir Publishers in 1975. A new cover was made using an image in the book. If anyone has access to original paper cover please share a link. You can get the book here (IA) and here (filecloud). See FAQs for password related problems. This entry was posted in astronomy, books, engineering, mir books, mir publishers, physics, soviet, technology and tagged antimatter, atomin nuclei, chain reaction, critical mass, diffusion of neutrons, dosimetry, elementary particles, fast reactors, heavy water reactors, interactions, light water reactors, non-critical reactor, nuclear physics, nuclear reactors, physics, quantum mehcanics, radiation shielding. Bookmark the permalink. very thanks for your efforts. Thanks db.jan for the link.